News Welcome to the world of work! 09.09.2015. A group of 55 new trainees has started a new chapter in their lives at the Friedhelm Loh Group. They were welcomed by Dr. Thomas Steffen, Managing Director Research and Development, who gave them their first top tips for a successful traineeship. 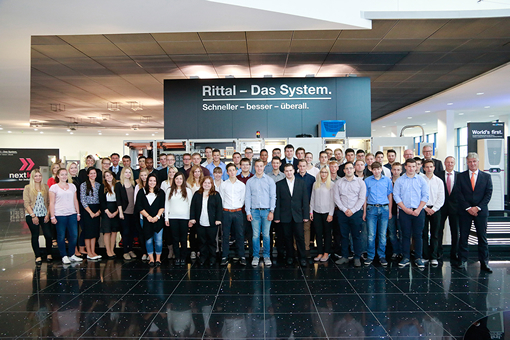 The ‘Internet of Things’, ‘smart factories’ and ‘big data’ – even at their official welcome event, the Friedhelm Loh Group’s new trainees were plunged into the themes that are currently taking the industry by storm. “These are the developments that will dominate your training over the next few years,” explained Steffen, as he welcomed the new intake to the group. “These watchwords show that we’re offering you a fascinating job that is focused firmly on the future, but also that we expect a lot from you in return – in terms of your performance, commitment and enthusiasm.” The up-and-coming specialists were told of the dynamic environment that the region’s biggest employer offers them. 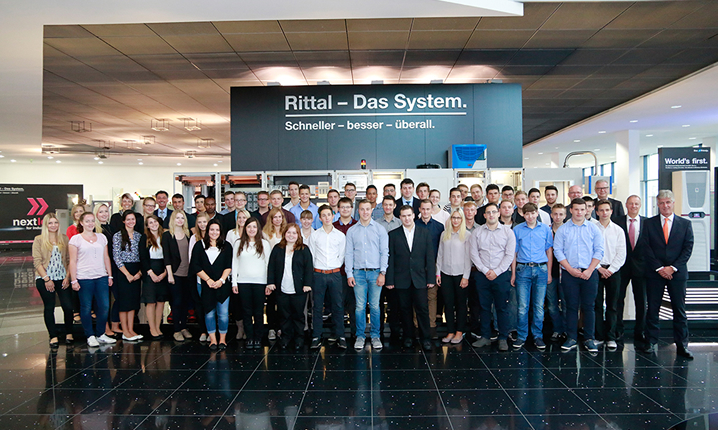 Image: An exciting traineeship lies ahead: Dr. Thomas Steffen, Managing Director Research and Development, welcomes the 55 new trainees with Matthias Hecker, head of commercial and technical training at Rittal, and Tina Pfeiffer-Busch, training coordinator at the Friedhelm Loh Group.